COLUMBUS, OH – (November 14, 2018) – (GLOBENEWSWIRE) Intellinetics, Inc. (OTCQB: INLX), a cloud-based document solutions provider, announced financial results for the three and nine months ended September 30, 2018. Total Revenue increased 22% from Q2 2018. Total Revenue flat from Q3 2017. 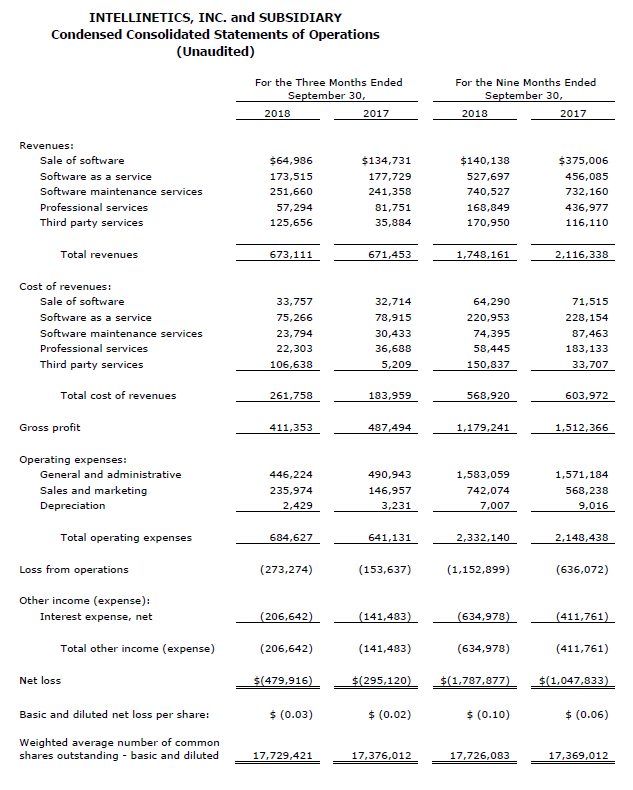 Software as a Service Revenue decreased 2% from Q3 2017. 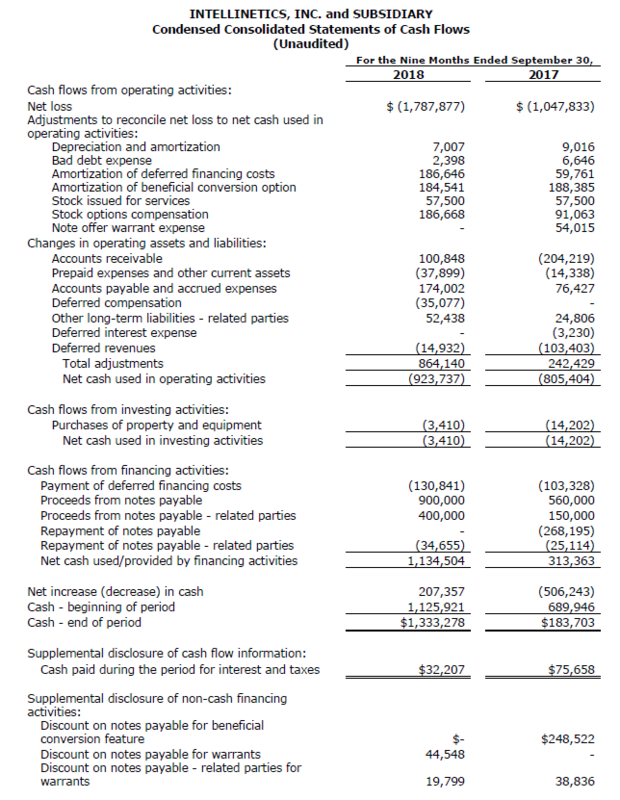 Adjusted EBITDA Loss of $208,362. Revenues for the three months ended September 30, 2018 were $673,111 as compared with $671,453 for the same period in 2017, and as compared with $549,678 for Q2 2018. Intellinetics reported a net loss of $(479,791) and $(295,120) for the three months ended September 30, 2018 and 2017, respectively, representing an increase in net loss of $184,671. The increased net loss was a result of lower revenue, driven by lower one-time software and professional services sales compared to 2017. Net loss per share for the three months ended September 30, 2018 and 2017 was ($0.03) and ($0.02), respectively. Revenues for the nine months ended September 30, 2018 were $1,748,161 as compared with $2,116,338 for the same period in 2017. 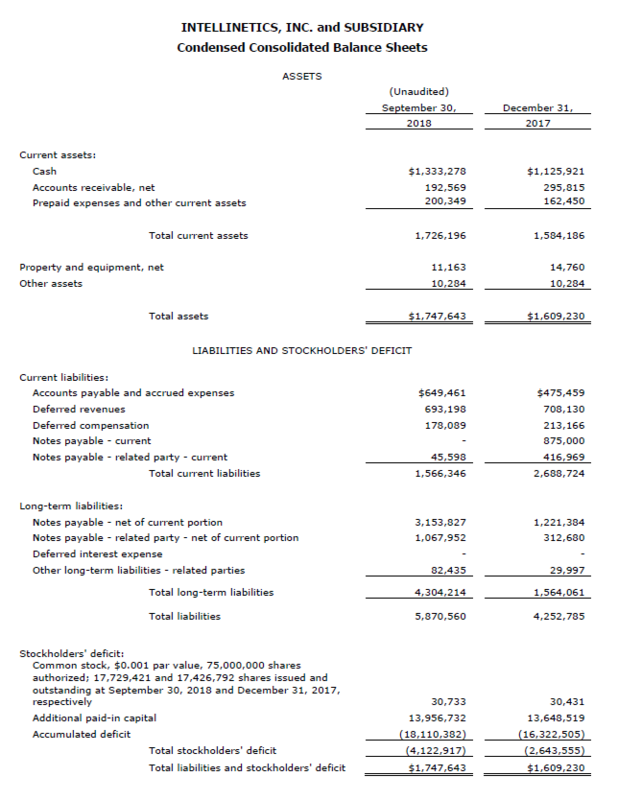 Intellinetics reported a net loss of $(1,787,877) and $(1,047,833) for the nine months ended September 30, 2018 and 2017, respectively, representing an increase in net loss of $740,044. The increased net loss was a result of lower revenue, driven by lower one-time software and professional services sales compared to 2017. Net loss per share for the nine months ended September 30, 2018 and 2017 was ($0.10) and ($0.06), respectively. Intellinetics, Inc., located in Columbus, Ohio, is a cloud-based document content services provider. Its flagship IntelliCloud™ platform provides easy to use, affordable, secure document management to organizations that have critical document requirements and must always be audit-ready, including health and human services, education and law enforcement. Our customers save valuable time by immediately locating any form, file, record or document, and our commitment to superior customer service ensures users can remain focused on their mission. For additional information, please visit www.intellinetics.com.